CANADA: Boralex's net losses widened to C$50 million (US$38 million) in the first nine months of the year due to lower production volumes, amortisation expenses, and acquisition and financing costs, according to the company. The developer made a net loss of C$50 million between 1 January and 30 September, compared with a C$18 million loss a year ago. This included a C$40 million loss in the third quarter alone, compared with a C$26 million loss in the same period in 2017. Boralex stated that these results were primarily due to lower production at existing facilities, C$16 million in amortisation expenses, C$1 million in acquisition costs and C$3 million in financing costs. Its production inched up from 2,258GWh to 2,350GWh in the first nine months of 2018, but fell by 9.4% in the third quarter to 548GWh. 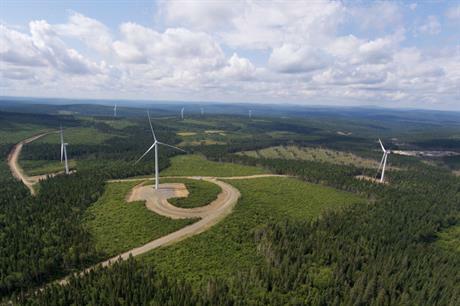 Meanwhile, it acquired Invenergy’s interests in five wind farms in Quebec, Canada, for C$215 million in September and bought French company Kallista Energy for C$171 million in June. Its earnings before interest, tax, depreciation and amortisation (Ebitda) in the first nine months of the year increased 9.2% year on year to C$200 million, however. Ebitda for the third quarter remained flat at C$39 million. Boralex said the contribution of facilities acquired and commissioned over the past 12 months and "sound performance" from its Canadian wind farms made a positive impact on its earnings. These factors also offset less favourable conditions for its wind farms in France and hydroelectric projects in the US and Canada, it added. The company intends to commission six new projects with a combined capacity of 97MW in Canada and France by the end of the year. Boralex said it is looking beyond its traditional bases in Canada and France, targeting development in Europe, particularly in the UK. The Canadian company also develops hydroelectric, solar PV and thermal projects.